Dallas Movie Screenings: Are You Here? Are you here? This was the question I was asking myself regarding if the film would ever show up in terms of quality. And guess what, it didn't. This was a mess of a movie that tried to be more meaningful then it actually was. I am going to try and dissect this thing. Matthew Weiner, creator of “Mad Men”, writes and directs this tone confusing film. I am all for a film to be a good mix of comedy and drama, but I have never seen a film try so hard. Some scenes would have comedy and, literally, the next scene it will be a weird “dramatic” tonal shift that doesn’t work. The story is basic, or is it? As I was watching this, I noticed Weiner put some scenes in here to convey a message; but I couldn’t quite grasp what he was trying to say, because I was thinking about the tonal shifting and how it didn’t blend well. The story is simple, and somewhat messy regarding plot points, but Weiner tried to make it more meaningful and it didn’t come across that way. The acting, overall, is dull and it felt like none of them wanted to be there. 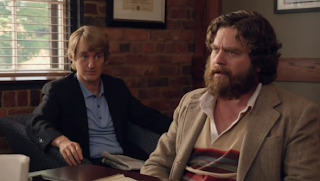 With a cast like: Owen Wilson, Zach Galifianakis (I still had to Google his name to make sure I spelled it right) and Amy Poehler, you figure this could be great, unfortunately, it came off like they weren’t trying; which is a shame because I love all three of them. The cinematography is good and I have no complaints, it is just the story and how average it came across. The film is almost two hours and I can tell you that it doesn’t need to be that long. It could have easily been trimmed. The more I thought about this film, the more I hated it. It’s one of those things where you don’t really know what you saw and don’t know how you feel. This is one of those times where I side with dislike, but I preface in saying, I want to re-visit it to understand what Matthew Weiner was thinking. This was a very average that tried to be something it wasn’t. I have never seen “Mad Men” but I am really cautious in checking it out after seeing this mess that almost bored me to tears. 2/10. If you would like to see more rage, check out my video review.